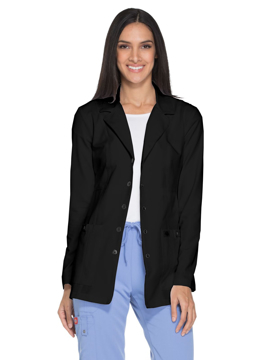 This iPad® unisex lab coat features a notch collar and lapel, button front closure, and a total of four pockets: one chest pocket, two exterior angled pockets, and one interior pocket to fit an iPad®. The back features a locker loop, pleats and stitched down back belt. Center back length: 37". 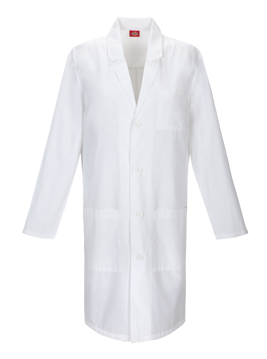 Contemporary fit button-front lab coat features a notched collar and two chest pockets, including one inside for extra storage. Also featured are two roomy patch pockets — one with an extra cell phone pocket and utility loop, the other with a pencil slot. A back belt and darts add shape. Center back length: 30". 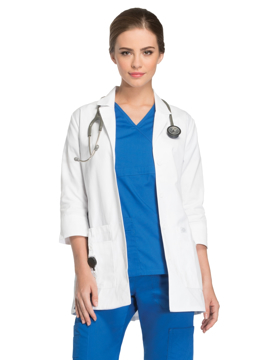 Contemporary fit button front lab coat features a notched collar, and four patch pockets, one chest pocket, two front angled pockets, one cell phone pocket and a hidden instrument holder on the wearer's right pocket. Back princess seams and a back belt complete this picture. Center back length: 37". 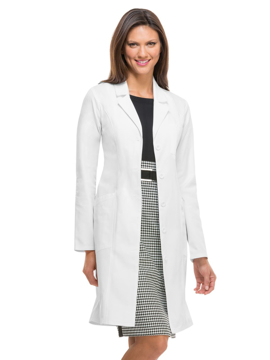 A fashion lab coat features a notched collar, princess seams, and a four button closure. Also featured are two patch pockets and the right pocket has additional sectional pockets for instruments and accessories. Back princess seams and back belt complete this coat. Center back length: 28”. 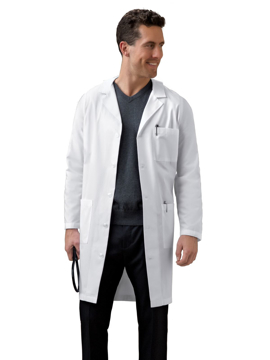 This men's lab coat features knot buttons, left chest pocket, two lower outside pockets, side slits for pocket access, and two-piece attached back belt. Center back length: 41". **PLEASE NOTE: EXPEDITED ORDERS FOR FASHION SEAL WILL NOT SHIP OUT THE SAME DAY. THERE IS AN ADDITIONAL $5 SERVICE CHARGE FEE INCURRED FOR ALL FASHION SEAL ORDERS, REGARDLESS OF QUANTITY. THIS FEE WILL BE REFLECTED IN YOUR FINAL INVOICE. 6-pocket side access men's lab coat with 2 tablet pockets, 2 inside pockets, 2 chest pockets and sewn down back band. Center back length: 37". Sleeve length: 24½" - 25½". 5-pocket princess seamed lab coat with 2 tablet pockets, 2 inside pockets, 1 chest pocket and back band. Center back length: 34". Sleeve length: 24½" - 25¼". 6-pocket lab coat with loose back belt, side access, and inside pockets. Regular center back length: 37". Long center back length: 41". Sleeve length: 24.625" - 25.5". 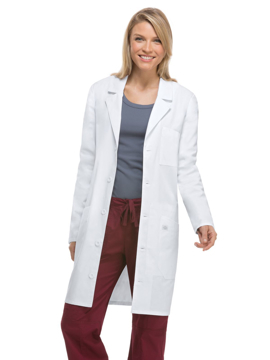 4-pocket lab coat with Velcro® closure on right pocket and inside pockets and set-in back belt. Center back length: 38". Sleeve length: 24½" - 25½". 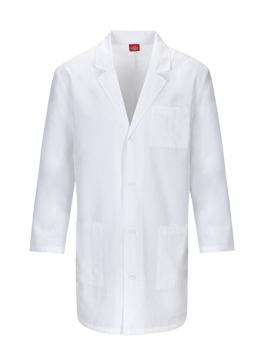 A men's tailored style lab coat featuring a four-button closure, belted back stitched over pleats, three front pockets, and side hand access. Center back length: 35". A men's lab coat featuring a four-button front closure, stitched-down back belt over pleats, three front pockets, two lower inside pockets, and side hand access. Center back length: 35½". 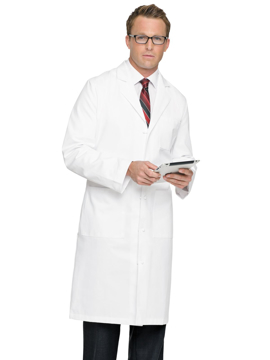 A staff-length men's lab coat with a four-button closure, three front pockets, and a sewn down back belt over pleats. Center back length: 35½".